130 min [ You get tough. You get tender. You get close to each other. Maybe you even get close to the truth. ] - Jack Nicholson is private eye Jake Gittes, living off the murky moral climate of sunbaked, pre-World War II Southern California. 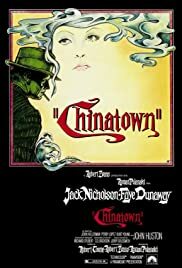 Hired by a beautiful socialite (Faye Dunaway) to investigate her husband's extra-marital affair, Gittes is swept into a maelstrom of double dealings and deadly deceits, uncovering a web of personal and political scandals that come crashing together.